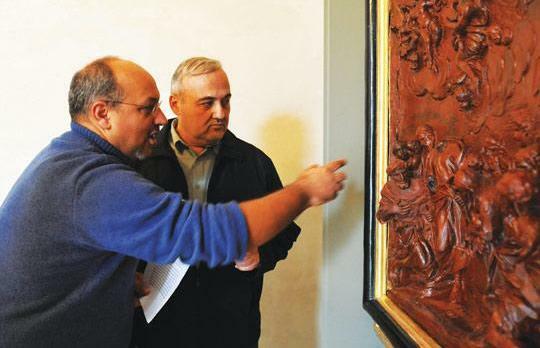 Italian restorer Giuseppe Mantella (left) and Fr Edgar Vella discussing a detail from the Adoration by the Shepherds. 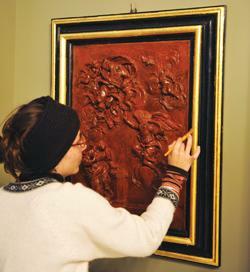 Four framed high reliefs in wax attributed to Melchiorre Cafà will be on public display for the first time on Saturday. The launch will coincide with the inauguration of Depiro Palace – which lies next door to the Mdina cathedral – as an extension of the Cathedral Museum. The wax reliefs were discovered by Italian restorer Giuseppe Mantella at the Chapter house in Mdina. Two represent the Adoration of the Shepherds, one shows the Glory of St Rose of Lima and the other, The Annunciation. The models used to hang in the refectory of the cathedral. Mr Mantella’s eye for detail had drawn his attention to them. The wax works were covered with plaster coated in silver paint. Several interventions were done in the 17th century including the addition of missing parts. Removing the plaster, Mr Mantella started realising that the style and composition of the models were extremely similar to other works by Cafà. Their stylistic representation reminded him of the statue of St Catherine by Cafà, which he had restored in Rome. “This discovery hit me like a bolt of lightning. It seemed like destiny had brought me to these works after having restored the St Catherine,” Mr Mantella said. The reliefs have several parts missing, particularly the heads of main characters. Asked why these parts were not redone, Mr Mantella said: “The interventions carried out during the 18th century did not fit Cafà’s style. The additions to the original where the heads were missing had ruined the model. “One cannot add bits and pieces because we do not know how they looked. According to restoration ethics, such interventions would be false,” Mr Mantella explained. On show together with these works will be a wax relief of The Glory of St Catherine of Siena, which belongs to a Maltese collector. This work by Cafà was finished by Ercole Ferrata – in whose studio in Rome Cafa worked – for the church of Santa Caterina Magnanapoli in Rome. The attribution to Cafà of the newly-found reliefs was backed by Sante Guido, a restorer and business partner to Mr Mantella. 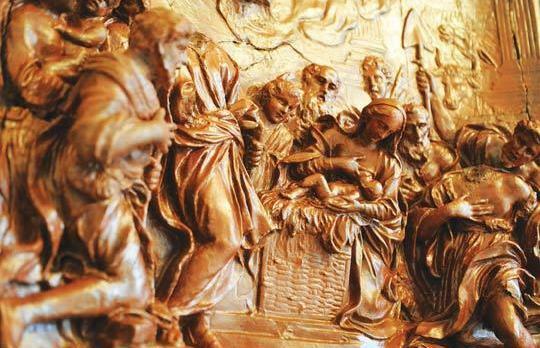 Details of this labour of love and the research done on Cafà will be included in a book, in English and Italian, called Melchiorre Caf Maltese Sculptor Of The Roman Baroque and which will also be launched on Saturday. At the Italian Cultural Institute in Valletta today at 6.30 p.m., Mr Guido will talk about the statue of St Catherine of Siena a Magnanapoli. Mr Mantella will talk about the restoration he carried out in 2006 of the same statue.